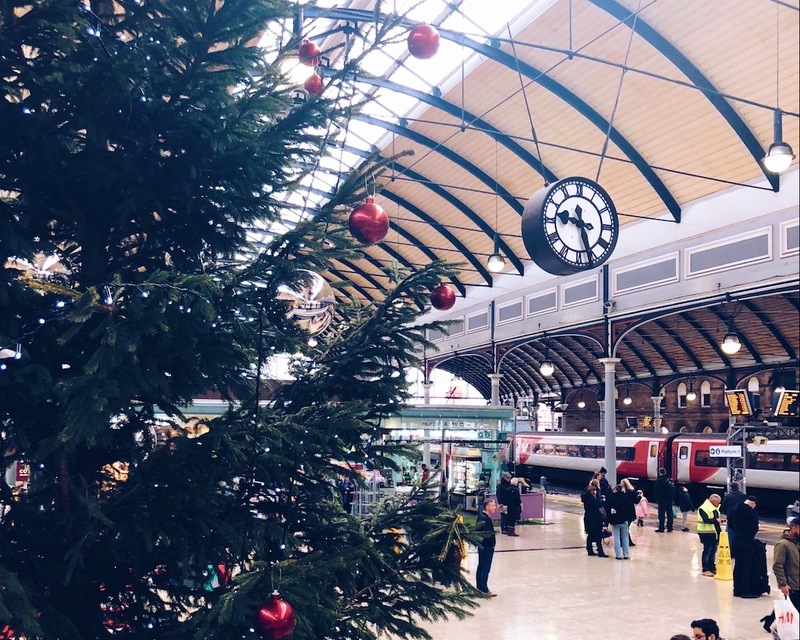 As much as I really try to leave it as late as possible to get in the festive spirit, it’s pretty difficult to avoid it now in everyone’s favourite North East city. 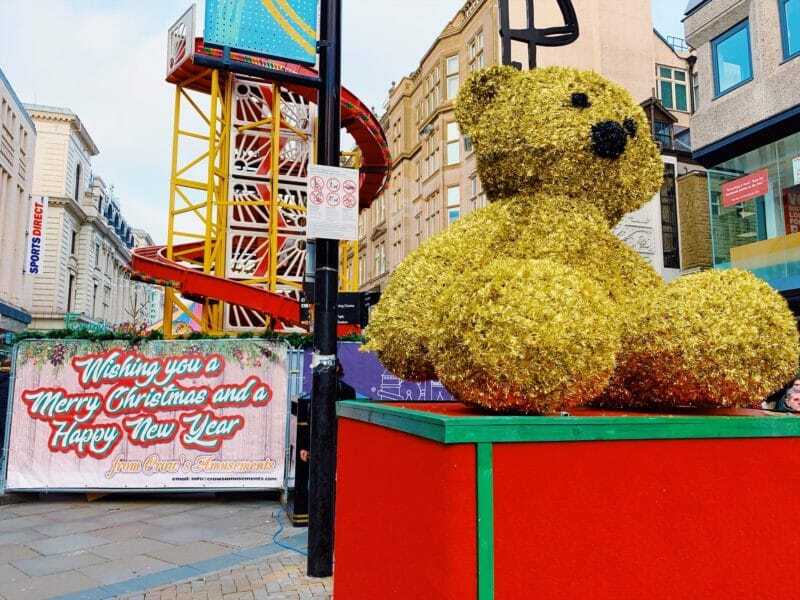 There’s all sorts going on already in the city centre, for both adults and children alike, and there’s still plenty more to come too. 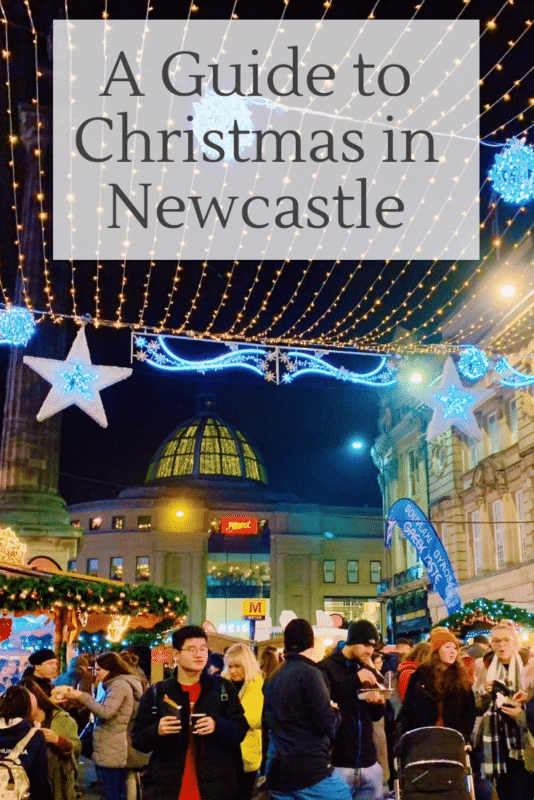 So if you’re looking for where to find some Christmas fun, how to join in, what to book, and what to miss then here’s my guide on all things Christmas in Newcastle. 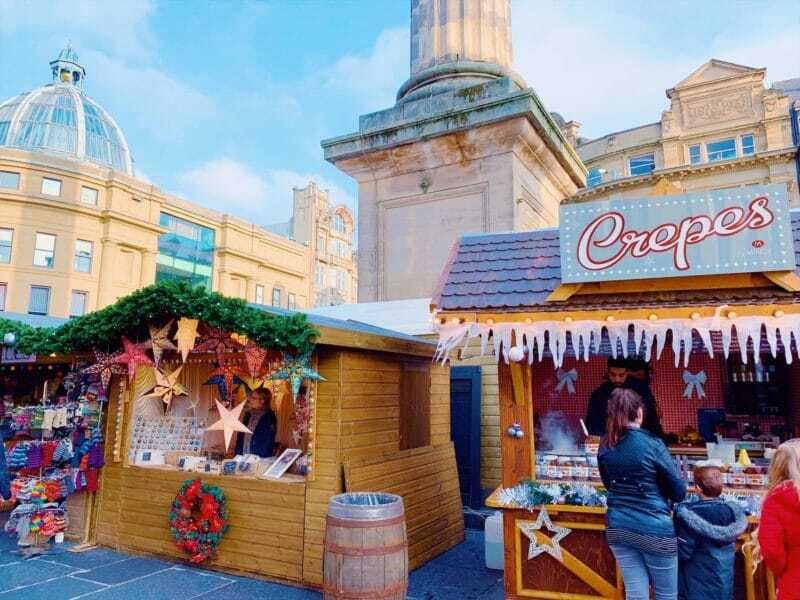 Just opened at the weekend the Newcastle Christmas market located around Grey’s Monument is here for longer than usual this year, right up until 16th December in fact. 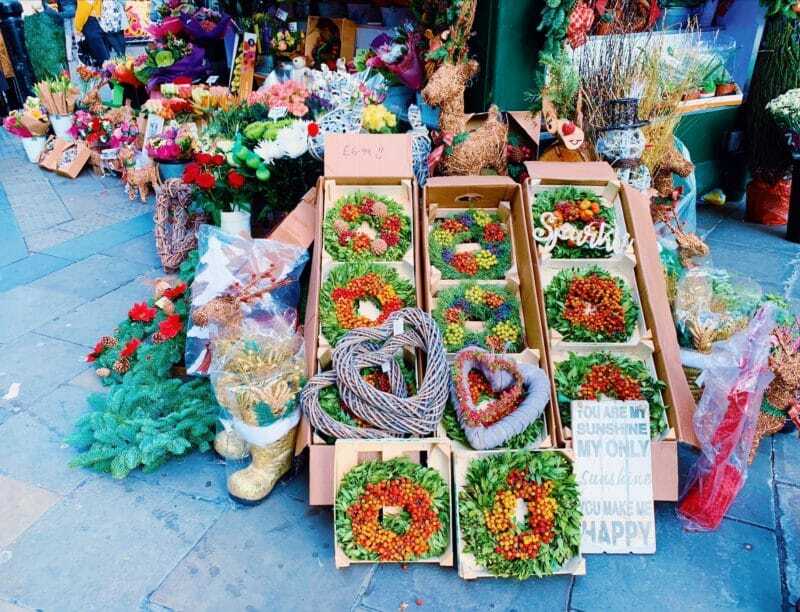 Compared to the likes of Edinburgh and York, Newcastle market is a lot smaller, and has always previously felt like it barely scratched the surface of it’s full potential. I’ve been along this year both in the daytime and the evening once dark, and I honestly believe they have upped their game this year. It was definitely bigger, had a lot more quality gift stalls, as well as the usual festive tat of course, but the real highlight is the food. 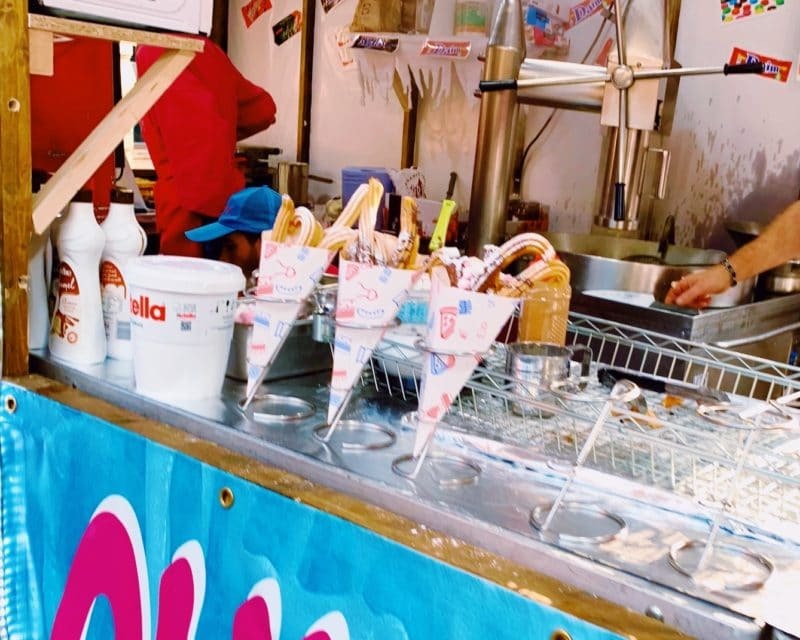 There are a LOT more food options available than past years, with new additions including halloumi fries, Yorkshire pudding wraps and bubble waffles with all sorts of toppings. The queues for all of these were pretty big so they’re obviously proving popular. Old favourites are still there too, with crepes, churros, paella, tacos, stir fry, German sausage hot dogs, Greek gyros, cheese stalls and a giant pic n mix all open for business. 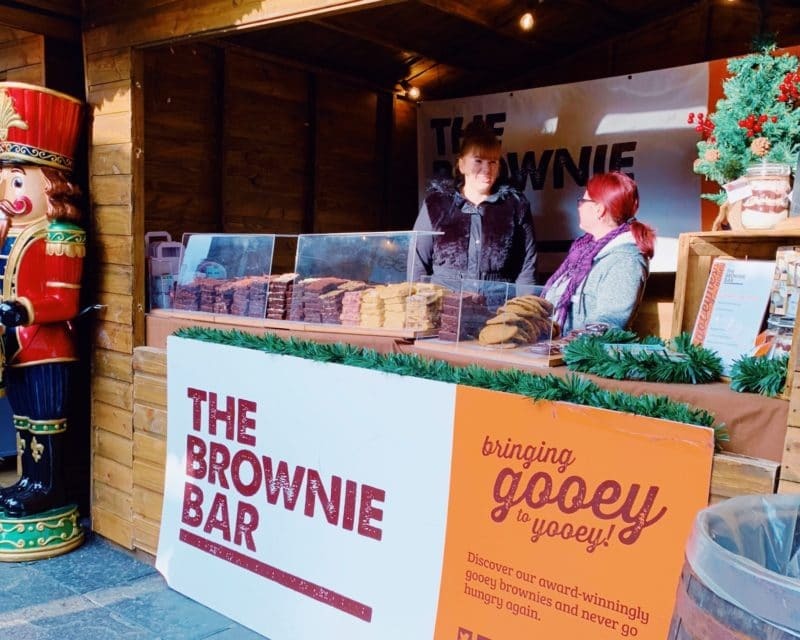 There’s a local touch with the likes of the Brownie Bar, who you might sometimes see down on the Sunday quayside market too. If you’re thinking of going definitely make sure you have an empty stomach because the food looks amazing. 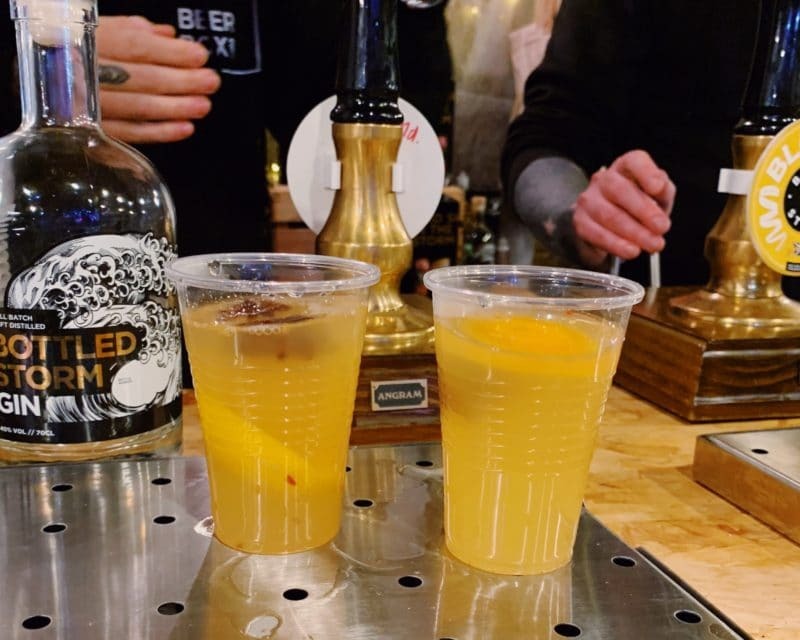 Along with a broad choice of good food there’s some new drinks on offer too, with stalls set up for local sloe gin – you can try before you buy the ladies are very nice, and even mulled gin. Of course the usual pints of beer and mugs of mulled wine and cider are there, but I really would recommend the mulled gin. It was so good, tasting more like warm apple juice with a Christmas smell that it would be very easy to lose track of how many you’re putting away. 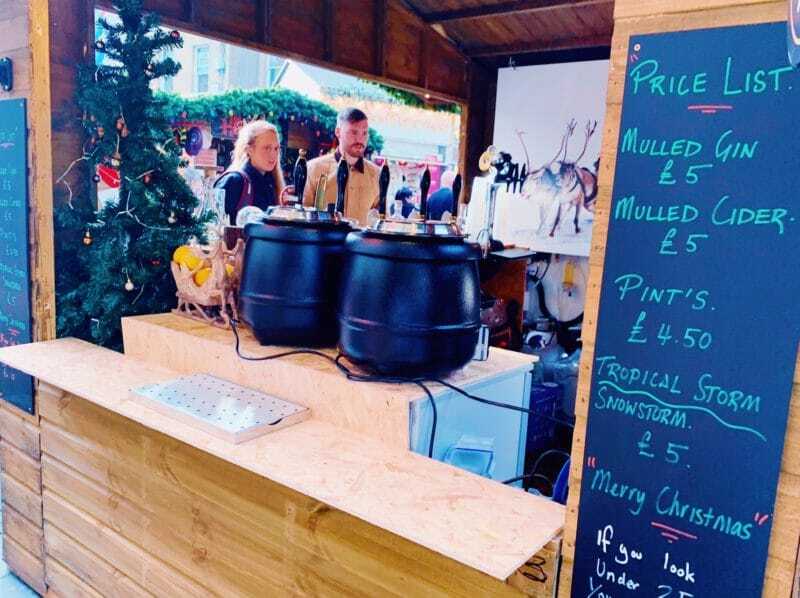 Head to a drink stall first and get your winter warmer to enjoy as you browse the gift stalls under the Christmas lights overhead. 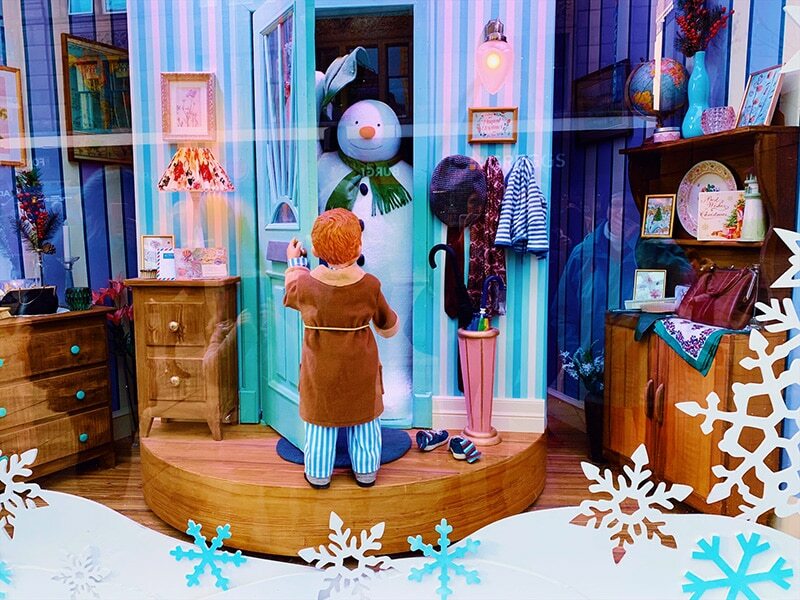 Unique to Newcastle and one of the most loved features of the city for locals and visitors alike, this years Fenwick’s window is The Snowman. My advice would always be to go early in the day, and avoid weekends, as it gets so busy. On Saturday afternoon the queue stretched right down to the bottom of Northumberland Street. If you do hit the crowds though don’t worry, you could grab a festive bake from Greggs opposite while you wait, and the street performers of Northumberland Street are now playing all the Christmas tunes. But apart from anything, the windows themselves are worth the wait. Each one tells a section of The Snowman story, with ‘Walking in the Air’ playing out over the crowds as you walk along. 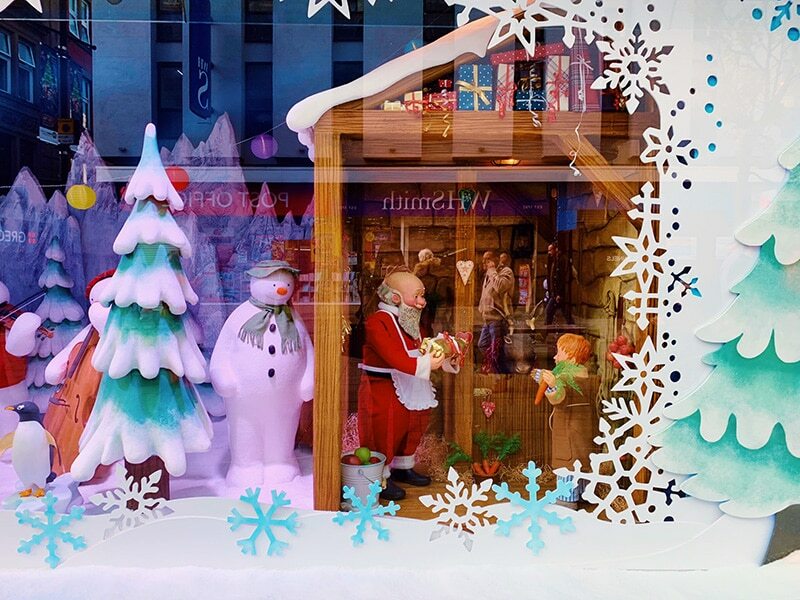 For more info and pictures take a look at my full Fenwick’s Window – The Snowman blog post. 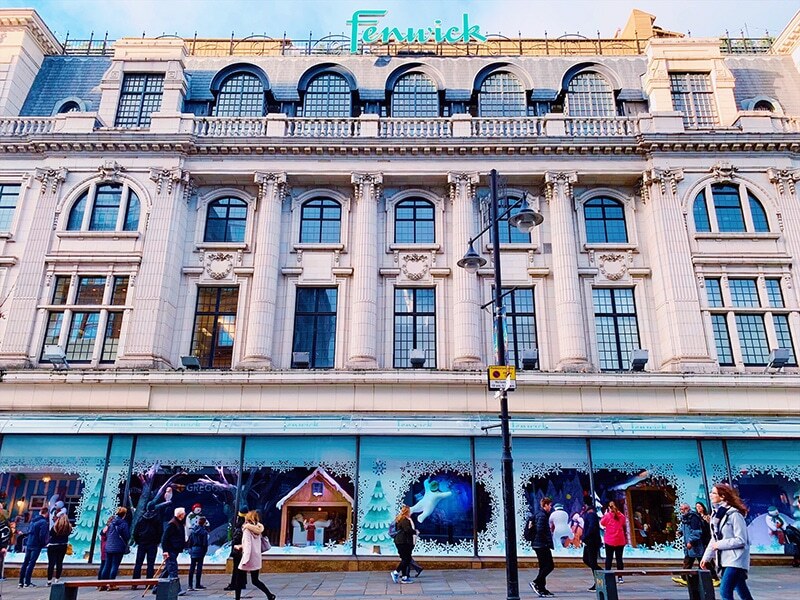 Fenwick’s don’t just stop at their Christmas window, the flagship store go all out and this year have added the Santa on the Rooftop experience to their festive activities. You have to book and I’m told that dates are now very limited, but for families this looks incredible. I don’t have kids but this post by North East Family Fun made me wish I did. You’re taken behind the scenes where the Christmas elves work, get wrapped up in Barbour’s winter clothing, take part in a creative workshop, and finally meet Santa. How amazing! 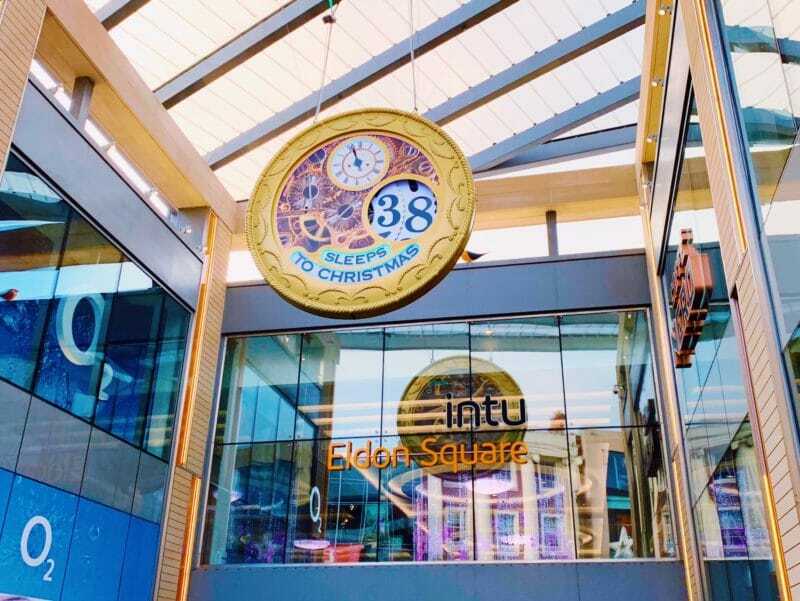 I had the pleasure of being invited to an event held by Intu Eldon Square a week or so ago, where they gave a group of us a run down on their Christmas campaign this year. 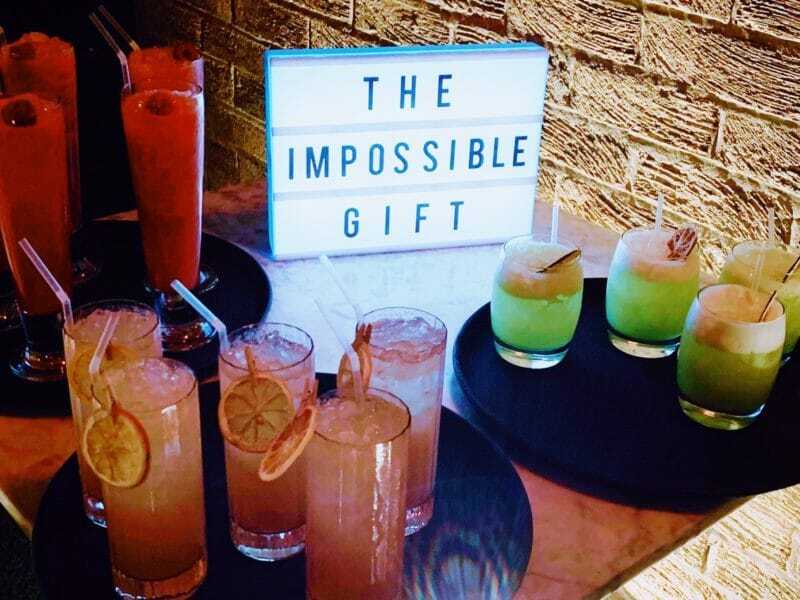 You might have seen their advert on TV, but they’re essentially trying to help everyone find the Impossible Gift, you know, for those that are really hard to buy for. 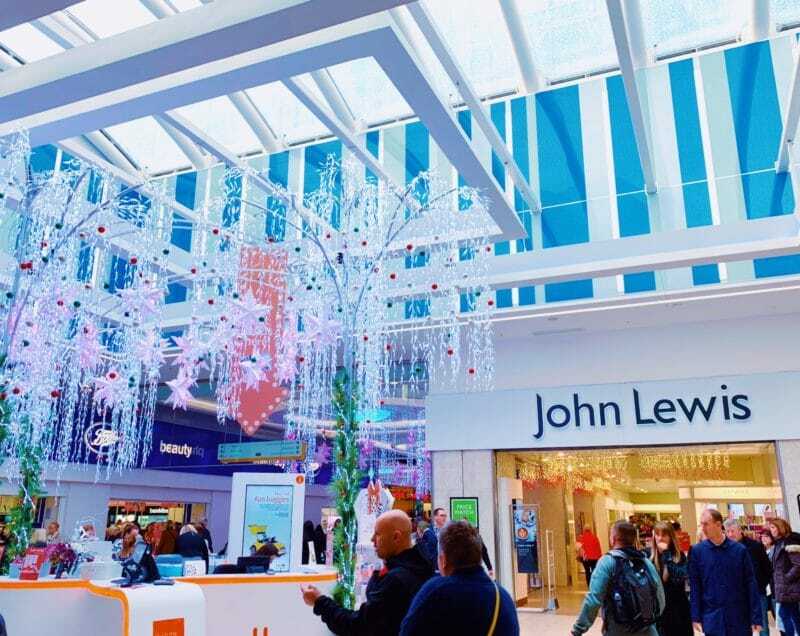 Intu Eldon Square are fully decked out with decorations now, and so are all the fabulous stores that you can shop from. 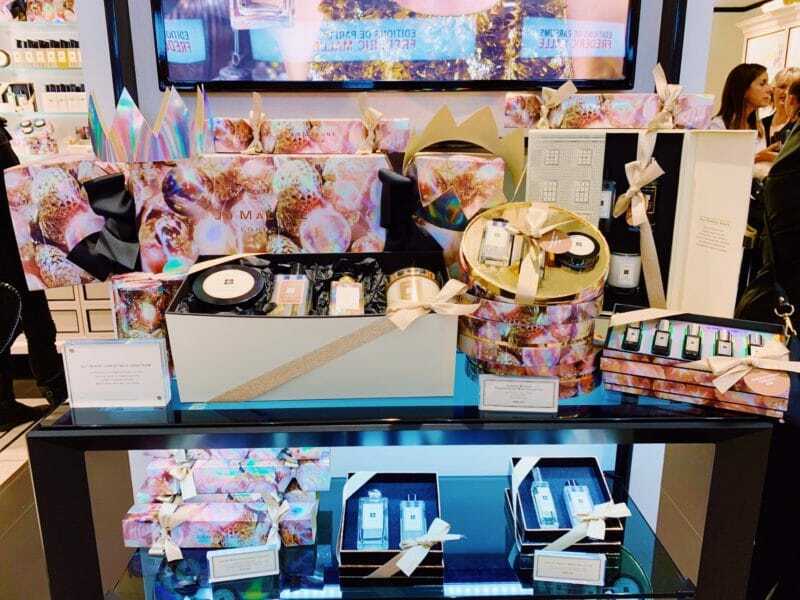 The Fenwick’s beauty hall is one of my most favourite places to get Christmas gifts, for everyone I know and also myself. I always love the Mac brush sets that they bring out with dazzling packaging every year, great value for a number of mini brush sets for eyes, lip and face and perfect for if you travel a lot. Jo Malone never fails to deliver when it comes to Christmas presents. My mum is getting harder and harder to buy for every year as she just has so much stuff, but if I’m ever stuck this is where I’d go. There’s even some luxury gift sets for men which smell amazing. Other department stores include John Lewis, Debenhams or M&S, again with fabulous beauty halls, homeware and clothing. I’m deciding if I’ll purchase the new Urban Decay palette this year, it’s quite similar to Heat but it’s become tradition that I get one every Christmas. 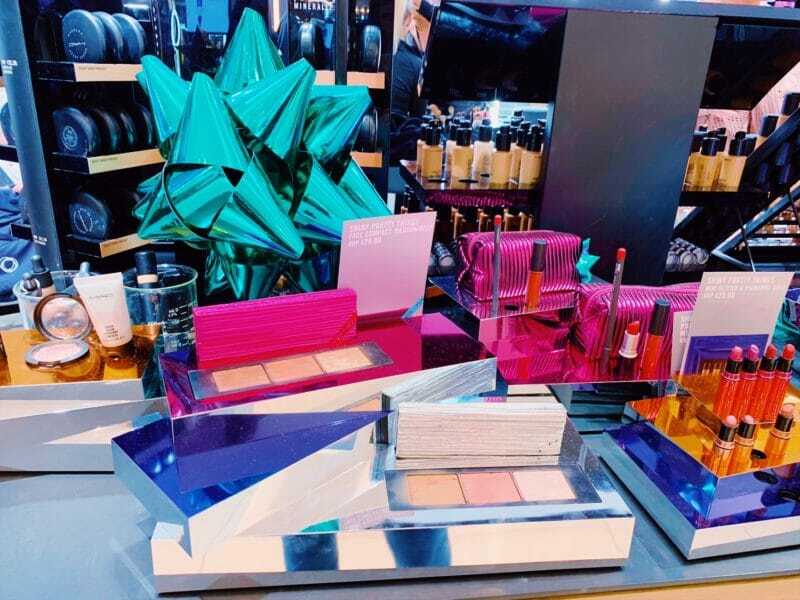 Other popular shops include Lush for some bathroom treats, high street cosmetics can be found at Boots, Kiko and the perfume shop, jewellery shops such as Pandora and Thomas Sabo, Apple, Kurt Geiger and all the well known high street clothing brands. 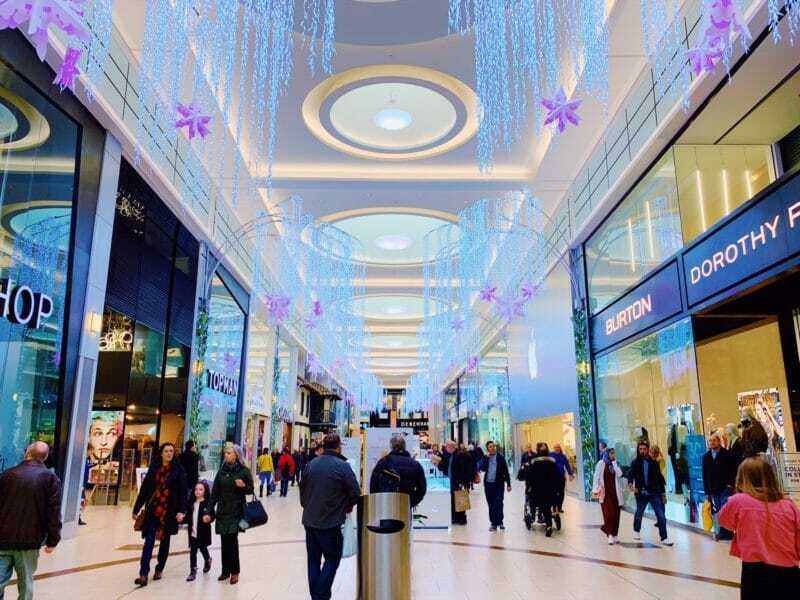 However hard someone is to buy for, you’re bound to find something at one of the Intu Eldon Square shops and I get so excited buying gifts for everyone. Intu Eldon Square challenged me to find the impossible gift for someone close to me, and while I can’t say here what I bought (in case they read it) I did manage to get something special at one of the shops I’ve mentioned. If you’re really stuck for someone then an intu gift card is a good idea, spendable in all the shops. 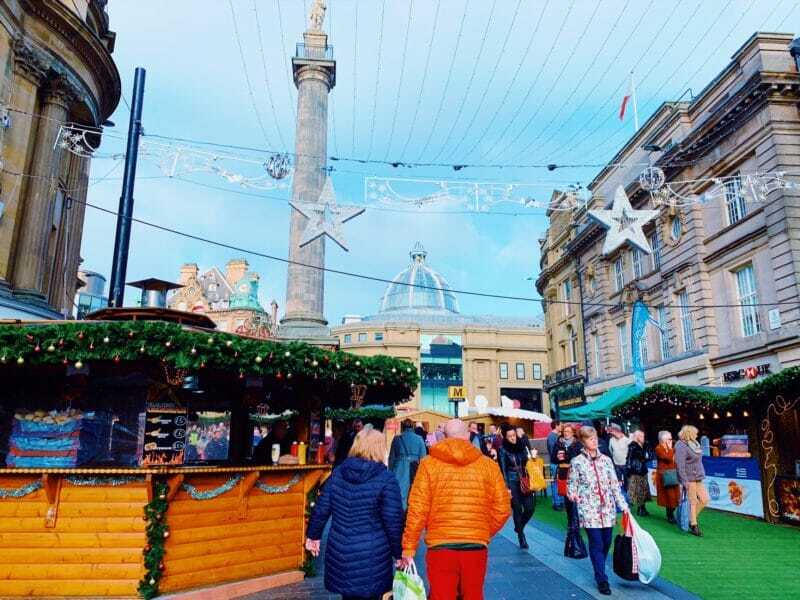 Newcastle has a huge range of restaurants and bars, but if the weather’s bad and you need a break from all the shopping, the food court at the bottom end of Eldon Square offers a good range of options. There’s plenty of fast food type places, such as StormPizza or TGI Fridays, but there’s also the Alchemist and Chaophraya. 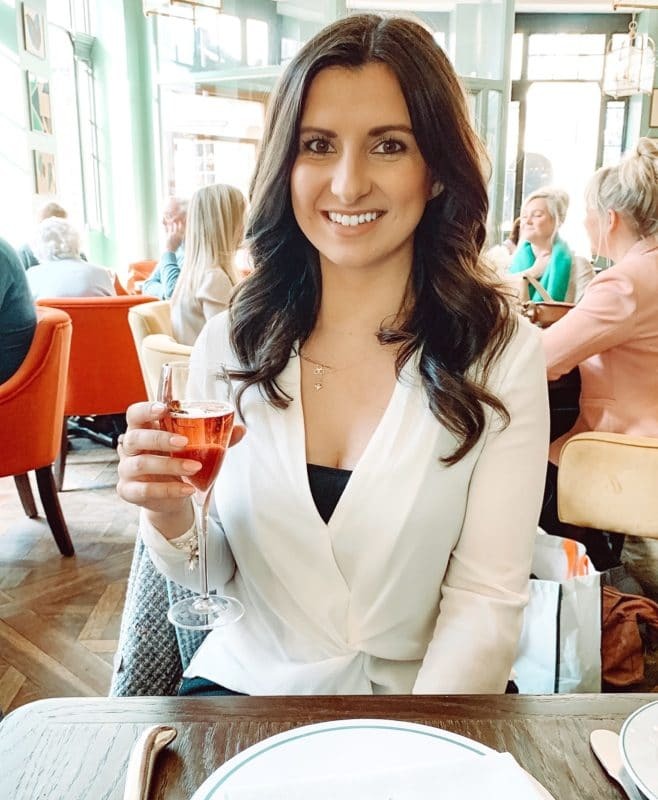 We enjoyed the private dining room at Chaophraya, somewhere that’s drastically improved since my first visit when it opened. We were served some very nice Thai tapas, and Christmas cocktails. 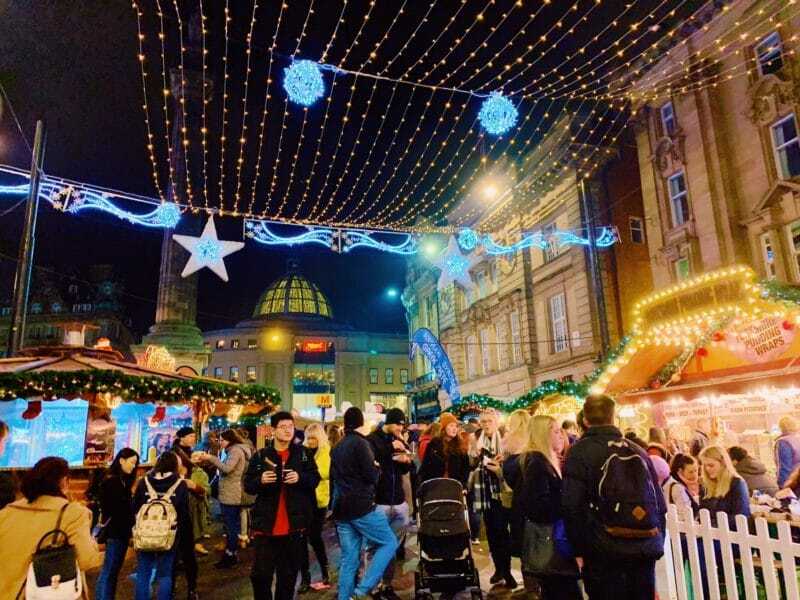 You feel miles away from the hustle and bustle up there, and the beautiful outdoor terrace offers a perfect view of Newcastle’s Christmas lights and market below. 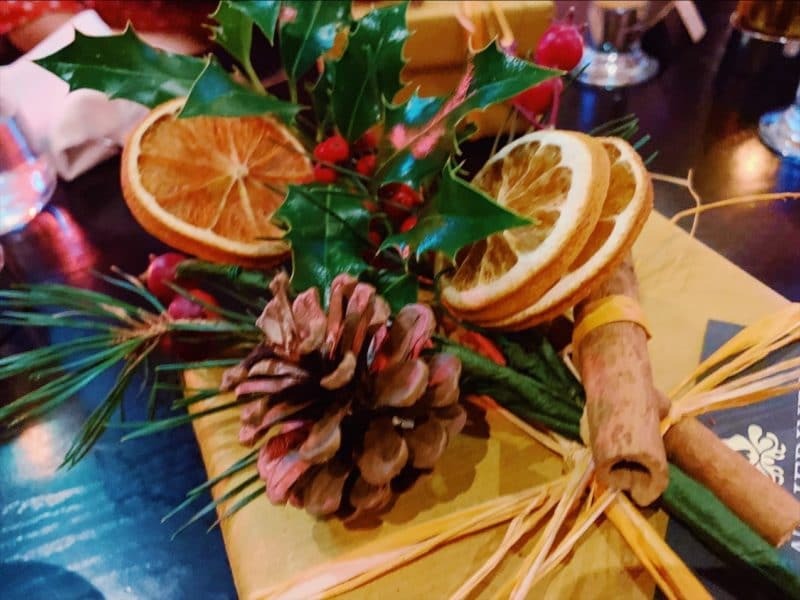 As part of our night with Eldon Square, we were also given an amazing workshop on creating your own Christmas wrapping corsage and decoration. I wasn’t the best at it, but it still turned out pretty cute! For a unique touch this Christmas get creative with your wrapping, or if you’re like me and useless under pressure, get the lovely ladies at Katherine’s Florists on Leazes Park road to do it for you. 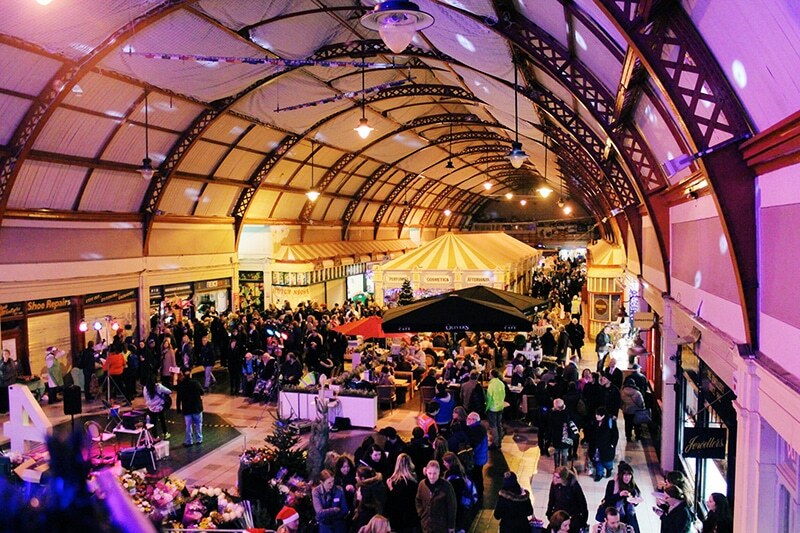 For an alternative shopping experience why not head to Newcastle’s oldest part of the city, the Grainger Market. 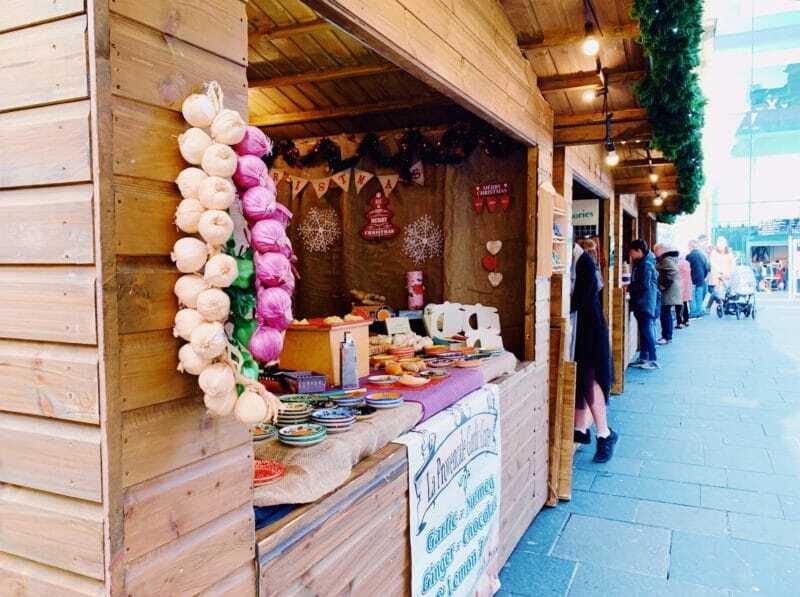 The historical market opens it’s doors in the evening at the start of December, and puts on a night of festivities and entertainment with all the local traders. It’s a great way to support local businesses like the Pet Lamb Patisserie (amazing cupcakes), Pumphrey’s, La Casa, the French Oven (amazing pastries) and Fez Food. You can also get your meat, fish, fruit and veg for pretty cheap, helping save the pennies over Christmas. 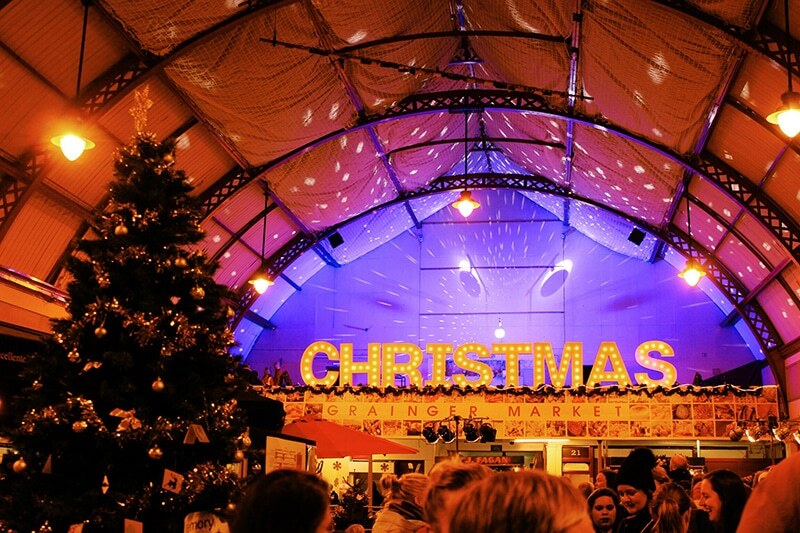 The Christmas night market also gives you access to the old Weigh House, where you can get weighed before and after Christmas (if you wish..), and the opportunity to see the old air raid shelter underneath the market. Take a look at more details and photos of the Grainger Night market here. Rumours of this bar first appeared a few months ago, and they’ve turned out to be true. The pop up Miracle on Grey Street bar is now open, and I think this one is going to be very popular. It opens daily at 12pm, and looks like a Christmas grotto from the outside. I was hoping to go in at the weekend but the queue outside was huge, even at 4pm. Expect a Christmassy take on cocktails and drinks, including prosecco and mulled wine, to enjoy against the background of all the Christmas songs you can think of, surrounded by fairy lights and decorations. Might be a bit too much for some, but sounds like Christmas heaven to me. This is something I’ve been dying to do for ages and I’m finally getting to go in December. 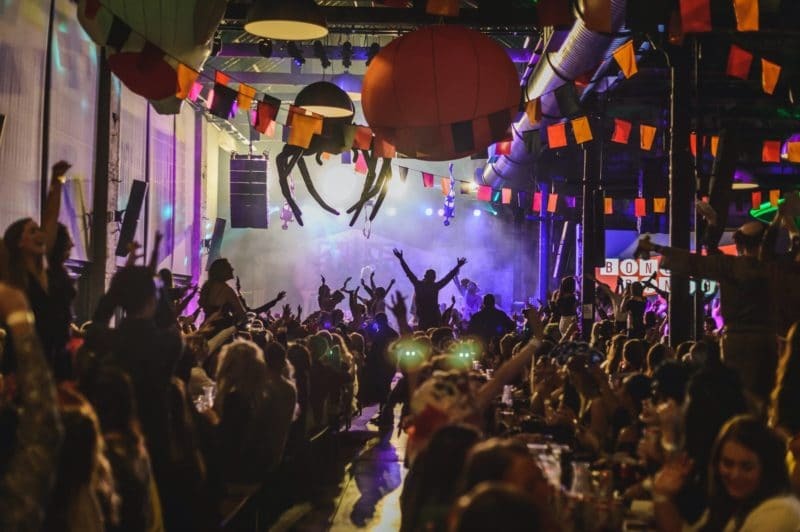 Bongo’s Bingo has taken Newcastle by storm, so much so that all the dates for November and December are now sold out, but there are dates available for January. That would make a good post Christmas pick me up, or tickets would be a good Christmas present. I’m going with some friends and judging by all the photos and how quickly they sell out we are in for a good night. Get your tickets for dates in the new year here. Despite being a feature of the Christmas scene in Newcastle for the last few years, I’ll hold my hands up and admit I’ve never actually been in for drinks. It’s always either been so busy, or way too hot. 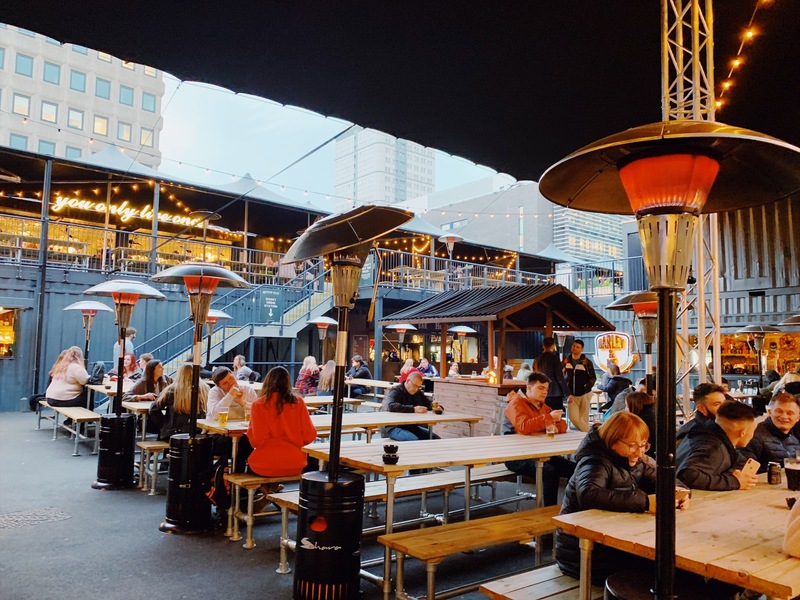 The winter pop up is obviously very popular though, with an open log fire, cosy seating areas, a winter drinks menu, and dogs are even welcome. I can totally see the attraction, and it’s a great spot for some day drinks. 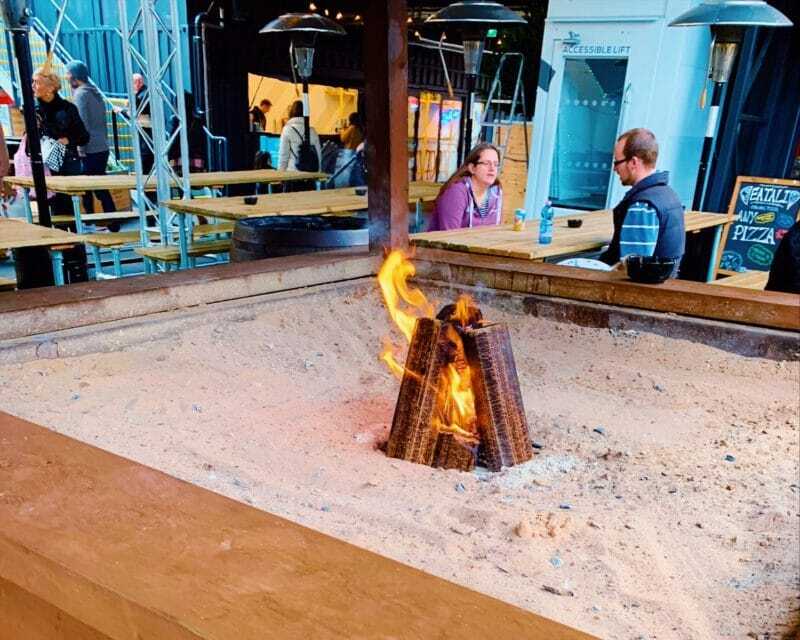 In Newcastle the tipi is located at the outdoor container community – Stack. Grouping these two togethers as they’re pretty similar, but Stack is located at the bottom of Northumberland Street, and By the River is as the name suggests, right on the river, Gateshead side. 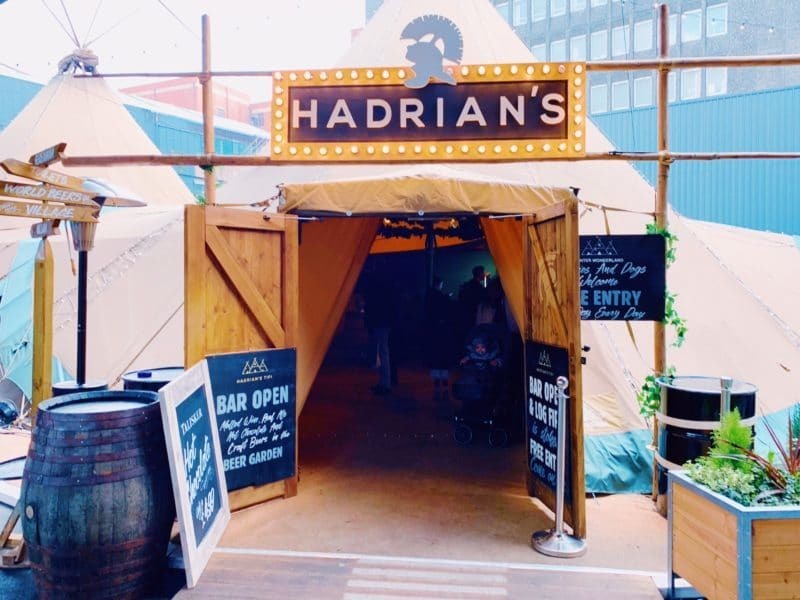 As well as the Tipi, you can find plenty of outdoor seating, an open fire, and lots of food and drink options as well as pop up stores in the surrounding containers. I’m told the Yolo coffee shop does some excellent coffees and hot chocolates…it even made New Girl in Toon’s best places for hot chocolate list. 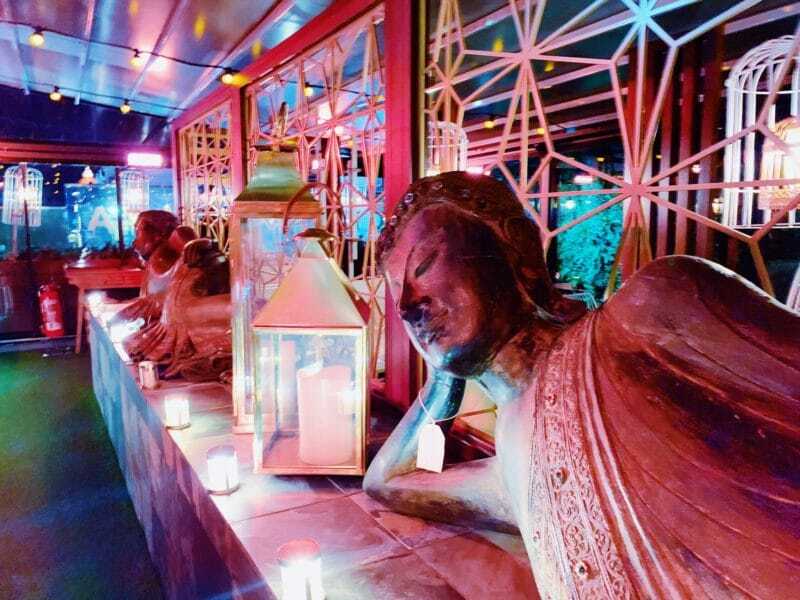 Other food and drink options include a Heineken bar, Yolo bar (reservations required), sushi, vegan food choices, fish and chips, burgers and pizzas. But it’s not just food and drink, there’s also a pet shop, a barbers, local clothing company Longhands Clothing and yoga available in the spaces here too. There has been a lot of talk about this Christmas village opening next to the ice rink at Times Square near Central Station. I went for a quick look on Saturday and I have to say I was a bit disappointed. The big ticket only beer hall looked pretty good, with proper beer keller benches and a stage for German music, but the rest of the village was more like four food stalls, and a smaller beer hut…and that’s about it. 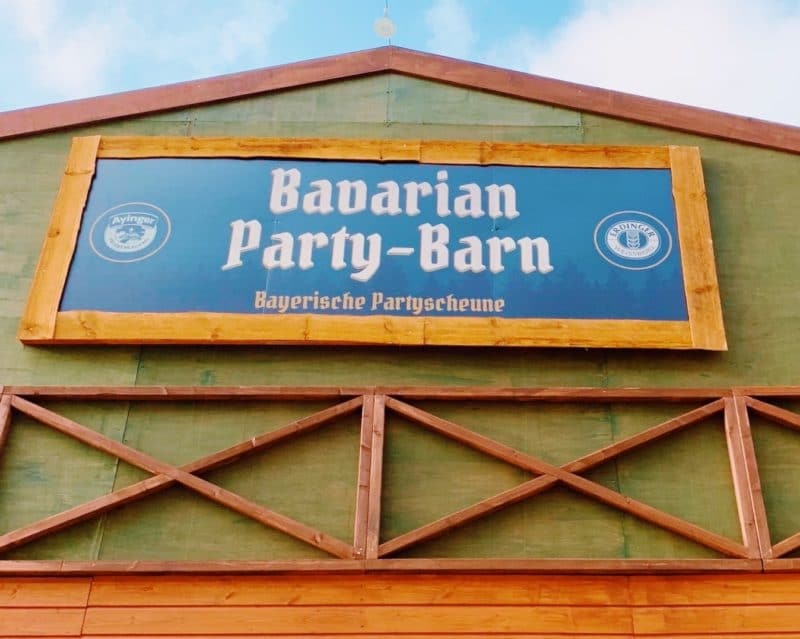 A ticket for £12-£14 for the Bavarian beer hall gets you a seat, a 2 pint stein or half a bottle of wine, and a German sausage, which does sound pretty good, alongside German oompah bands playing on stage. You can reserve on their website here. 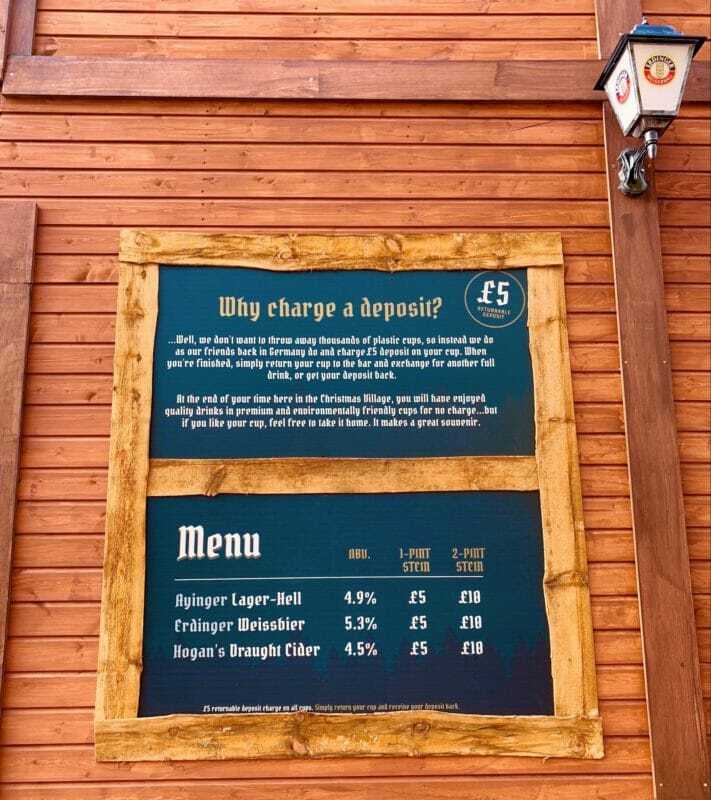 There’s a smaller beer hut that you don’t need reservations for, with some inside and outside seating, and a small number of food stalls, a Santa’s grotto, and a craft stall. I may have visited prematurely, as it might still be under construction, but I have to say I thought the Monument Christmas market had a lot more to offer. The ice rink is always popular, and is there until 23rd December. Adult prices start at £10 and kids £3 or £7.50 depending on their age. 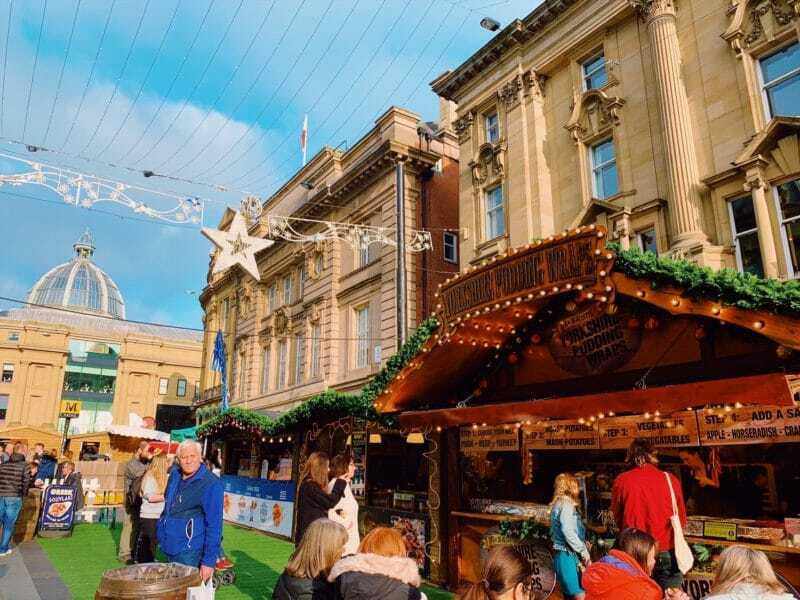 Where else for festive food and drink in Newcastle? 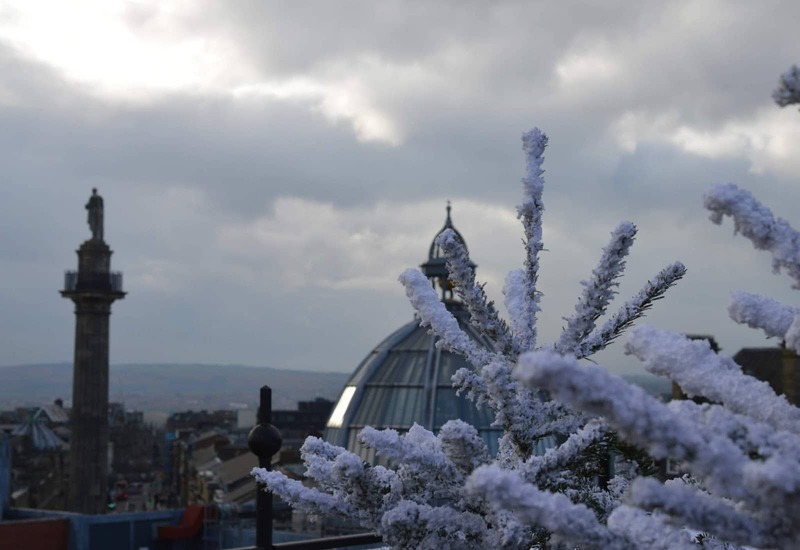 The Botanist rooftop terrace – I love it up there in winter, it’s so cosy and festive. 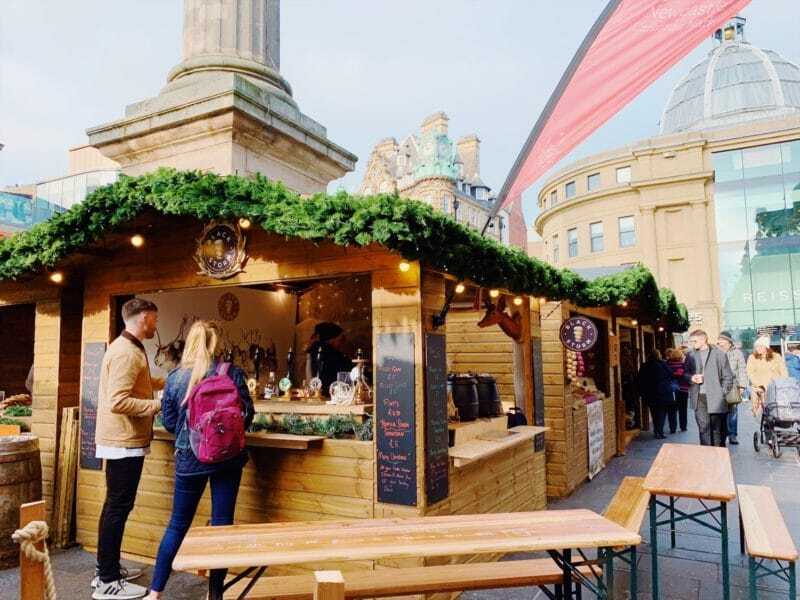 Despite being on the roof you can enjoy a sheltered mulled wine or cider in one of the huts, or on the picnic benches with a blanket wrapped around you. 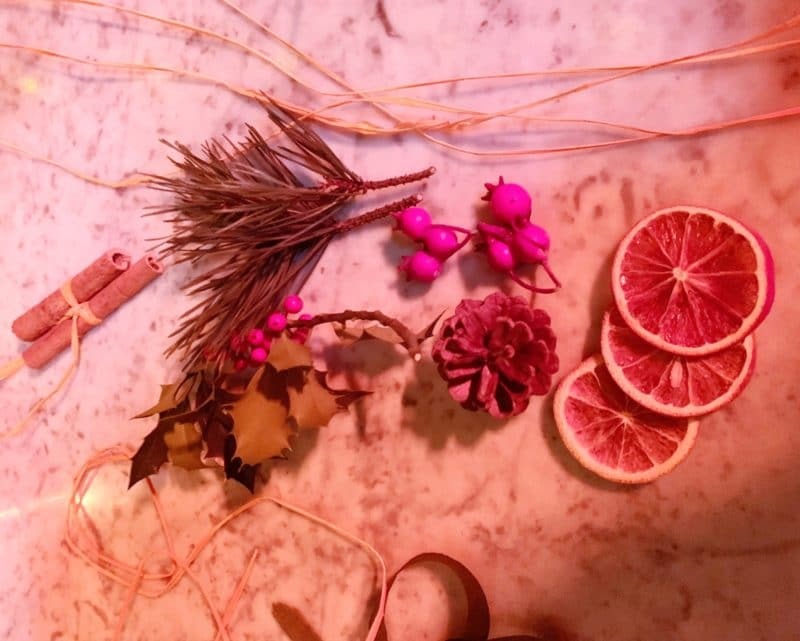 Take a look at my full post on the Botanist winter terrace here. 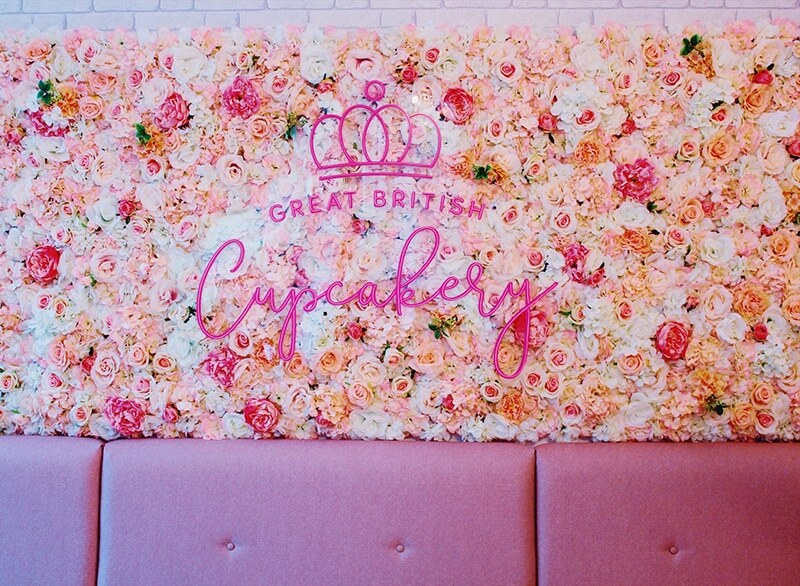 Great British Cupcakery Christmas afternoon tea – from 26th November – 24th December Newcastle’s pinkest and prettiest cafe is hosting a Christmas afternoon tea. The menu features turkey and cranberry and cheese and chutney finger sandwiches, a Christmas pudding scone, and a festive red velvet brownie. That all sounds amazing but it’s bound to be a sell out so secure your date fast! Bottomless prosecco at No. 28 – hidden away near the Grainger market No. 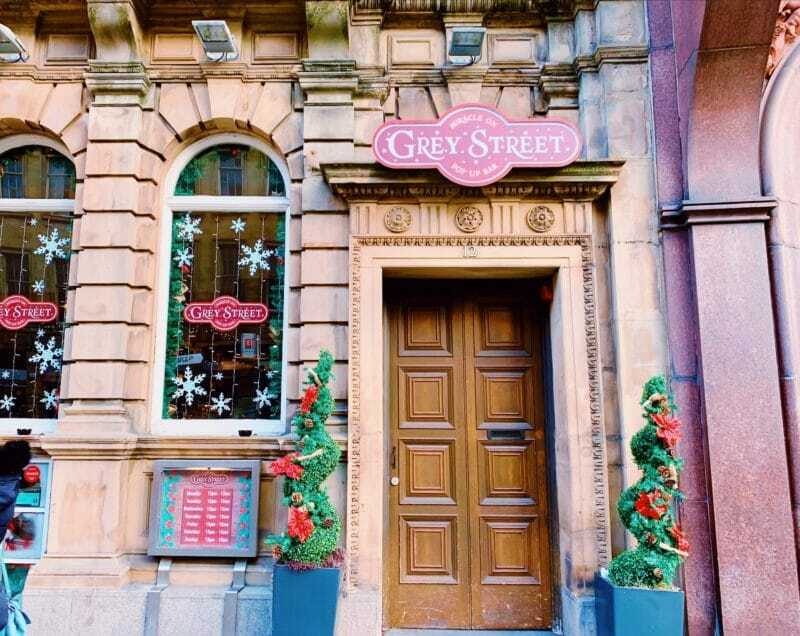 28 are offering 2 hours of free prosecco with their bottomless Christmas lunch offer every Saturday and Sunday. Browns Bar – I know it’s a chain but I was in here on Saturday night and it’s so festive! Their decorations are up and I was browsing their menu which has been transformed for the season. A busy but more relaxed place with a great atmosphere. The Hudson – The Hudson are also putting on a festive afternoon tea, in addition to their Christmas dinner a la carte menu. I really like their cocktails in the lounge too for a pre dinner drink. 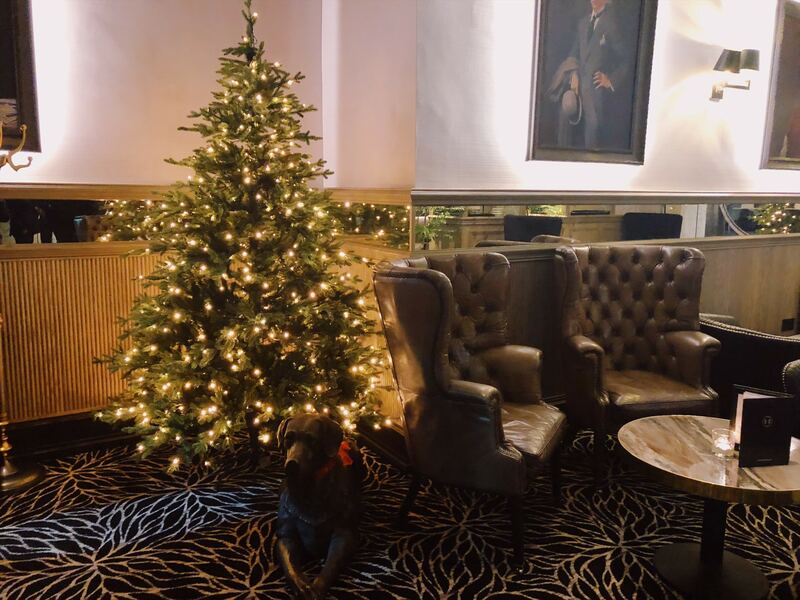 Malmaison – my favourite hotel in Newcastle, and they have a whole range of Christmas products on offer, for both if you’re just dining/drinking or if you’re staying too. 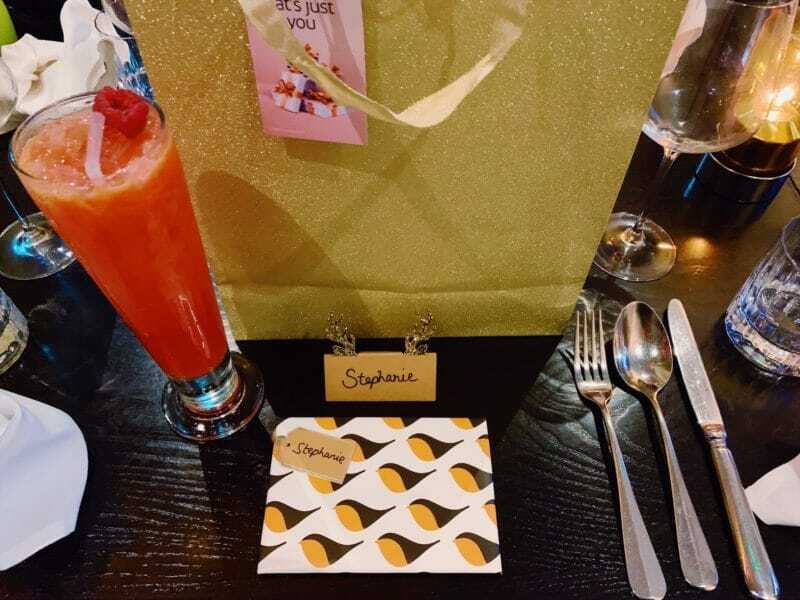 Their menu has afternoon tea with a festive twist, Christmas day lunch, a Boxing Day brunch, and a full New Year’s Eve package with a view of the fireworks over the river. I’d be doing this if my bloody parents hadn’t booked up already! 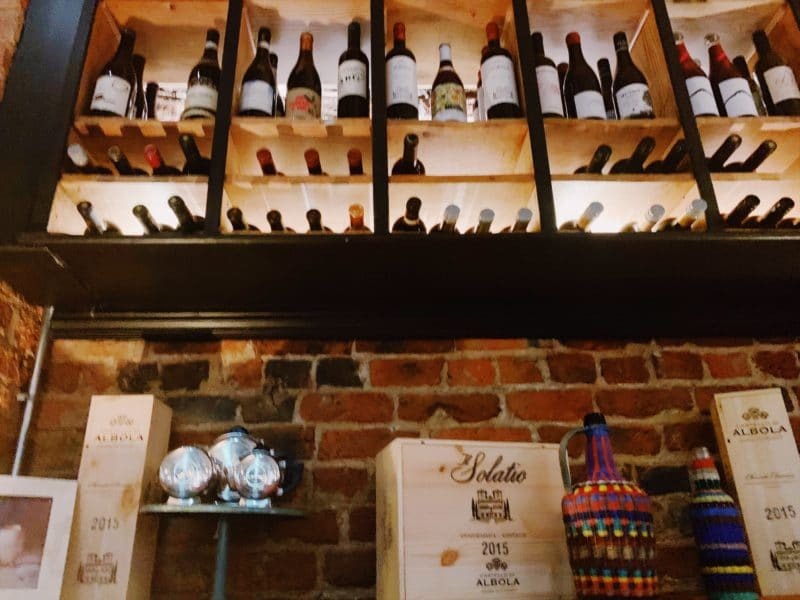 St Vincent’s – not strictly festive but a great new place in Newcastle, St Vincent’s wine bar is one of my new favourite places to go. Book a table for European style tapas, or simply head along to enjoy a bottle of wine at the bar. It’s located on Broad Chare, right next to Broad Chare pub, which is also one of my absolute favourites in winter. 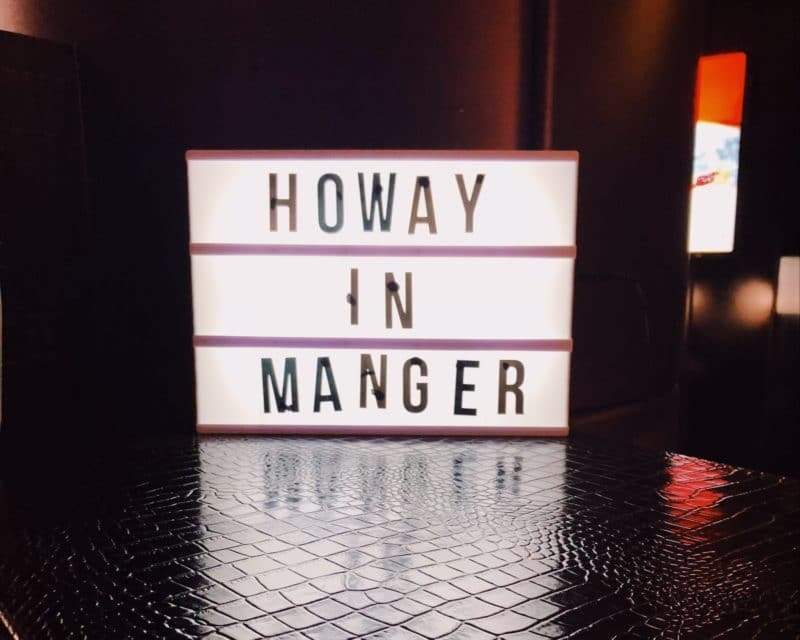 Of course all the bars and restaurants in Newcastle put their best foot forward at Christmas, but the above are just some of my favourites. 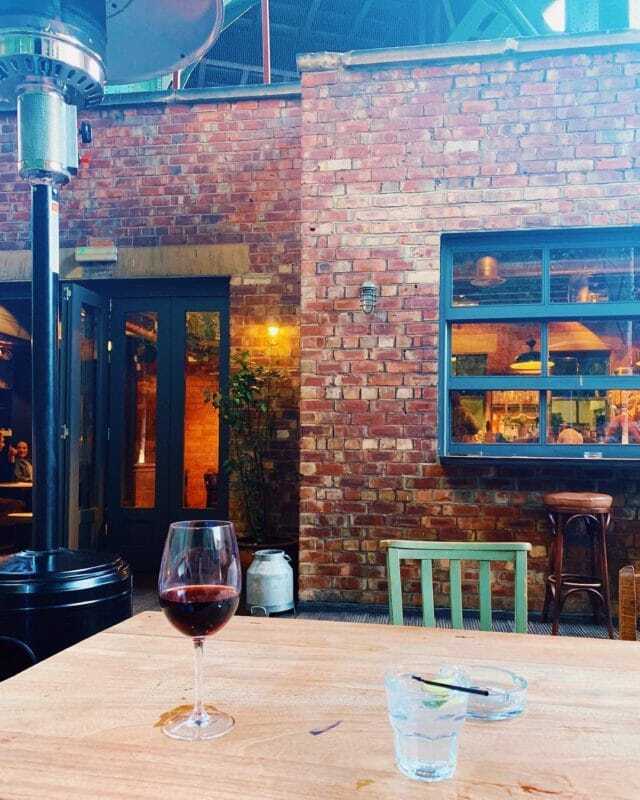 I published this guide to all the bars in Newcastle that have outdoor terraces in the summer, and the majority of these also have heaters for during the winter. Don’t let the cold North Eastern weather put you off, we wrapped up and spent a great Sunday afternoon on the Bridge Tavern terrace a couple of weeks ago. 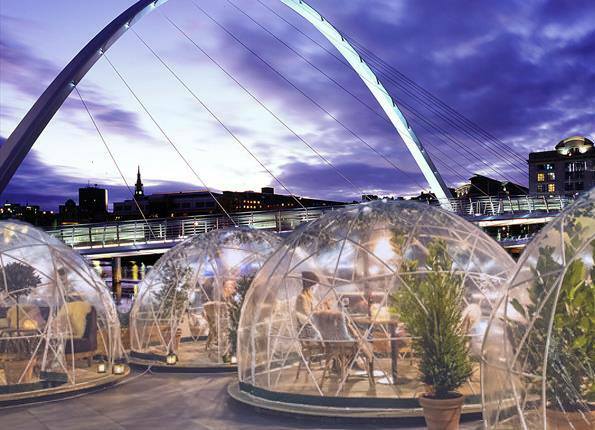 You may have seen these appear on Facebook this week, but it’s been confirmed that the Dine by the Tyne igloo pods are coming to Baltic Square on the Gateshead side of the river. My friends and I booked up very quickly for our girls Christmas day out when we are all finished work for the holidays. The pods seat up to ten people and depending on your reservation time are either £200 or £300 for ten people, working out at about £25 each. The menu is provided by Colonel Porters, and the price includes dinner and a welcome drink, as well as the pod for a set amount of time. I can’t wait to do something a bit different with the girls this year. 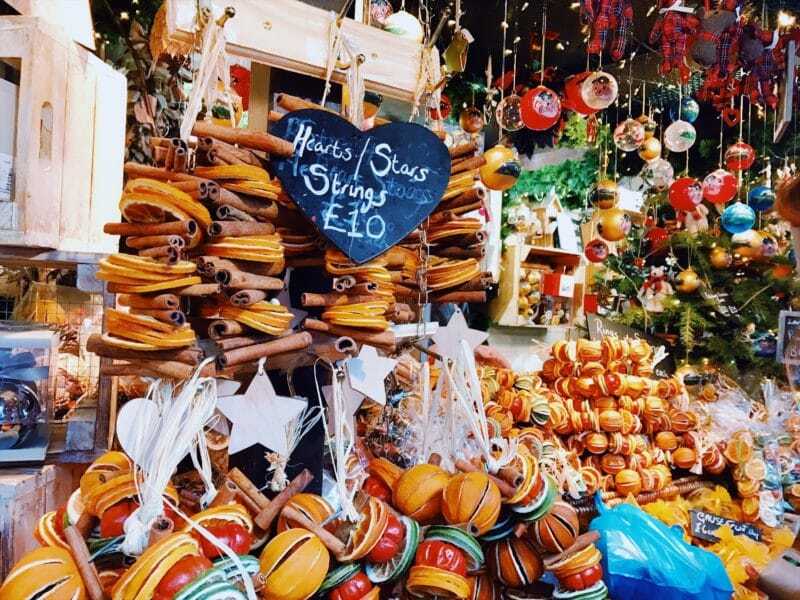 Edinburgh Christmas market – world famous the Edinburgh Christmas market takes some beating. 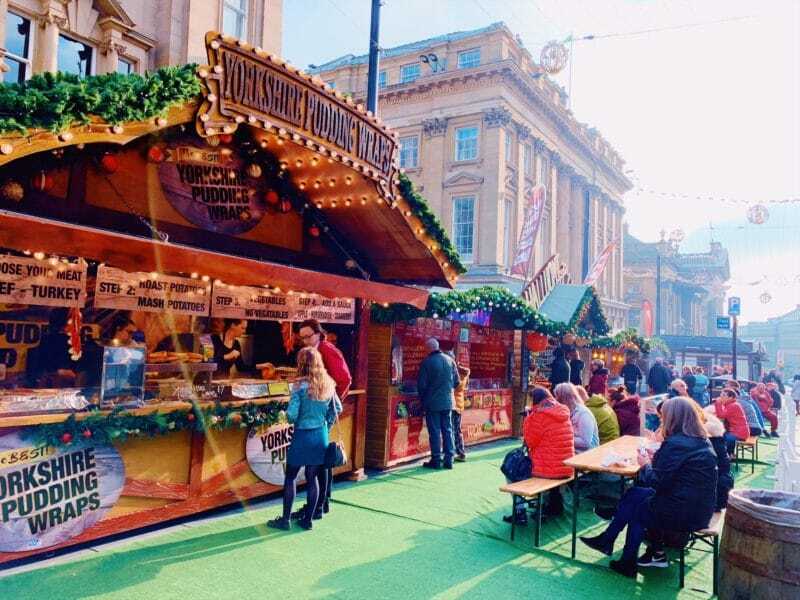 With so many rides, food options, different stalls and a very festive atmosphere, only a couple of hours away on the train. 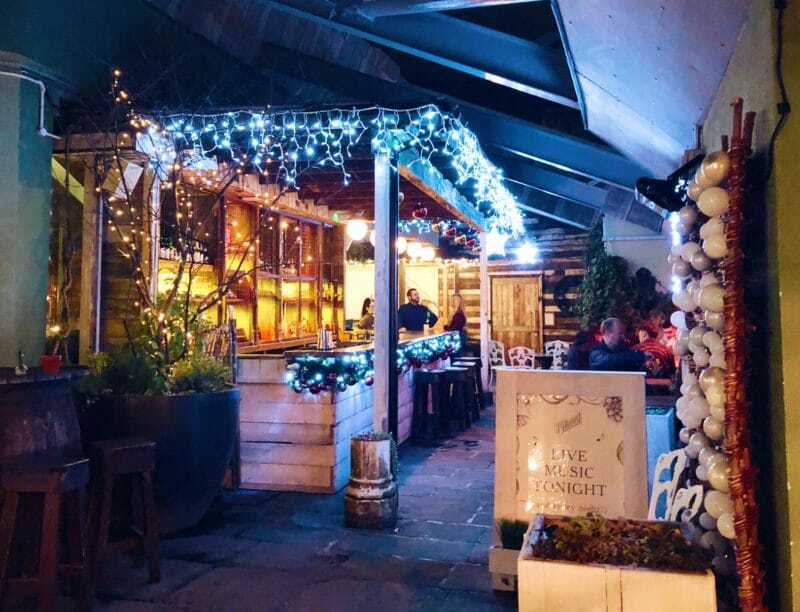 York – another very Christmassy place, with British favourites such as Betty’s and now the Ivy there too, but the best bit about York are all the quirky bars and pubs. Again only an hour away on the train. 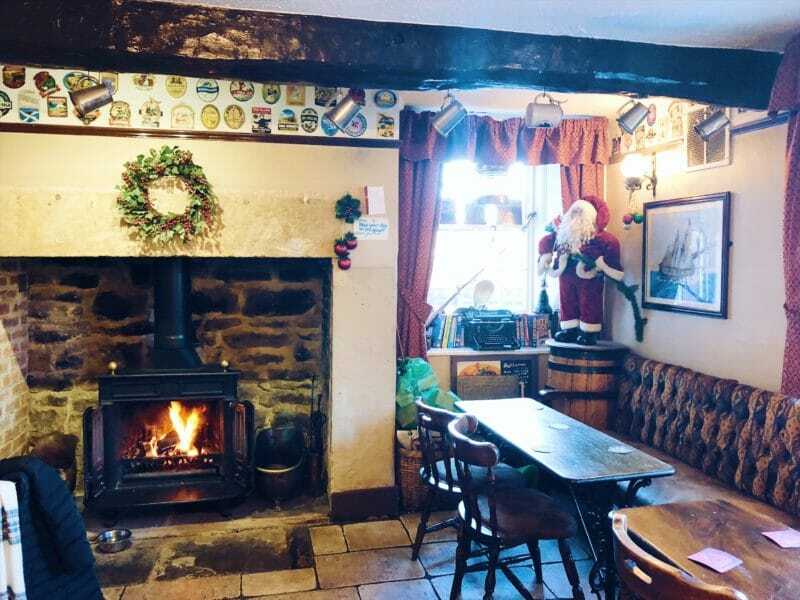 Corbridge – last year for our Christmas day of fun we went on a bit of a pub crawl up the Tyne Valley, stopping off at the Boathouse in Wylam which is adorable..
Once in Corbridge visit places like the Dyvels or the Angel for a very festive atmosphere. 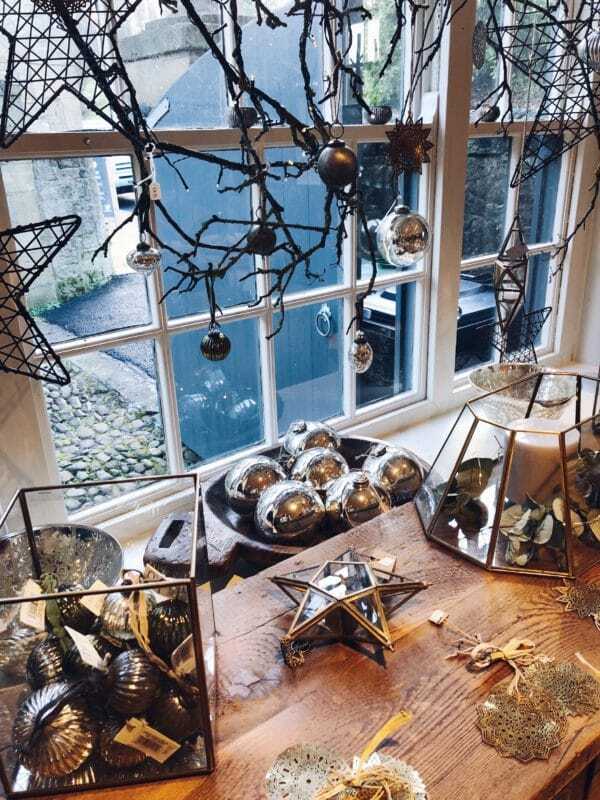 Next to the Dyvels is the most amazing little home and lifestyle shop, which is packed full of Christmas decorations and gifts. Face it people, with all this going on how can you not begin to get in the festive spirit. No scrooge’s over here please! Disclaimer: All photos in this post were taken by me unless otherwise stated. Thank you to North East Family Fun, Bongo’s Bingo and Dine by the Tyne Igloos for letting me use your pics. None of the brands or businesses asked me to include them in this post, all opinions are my own. 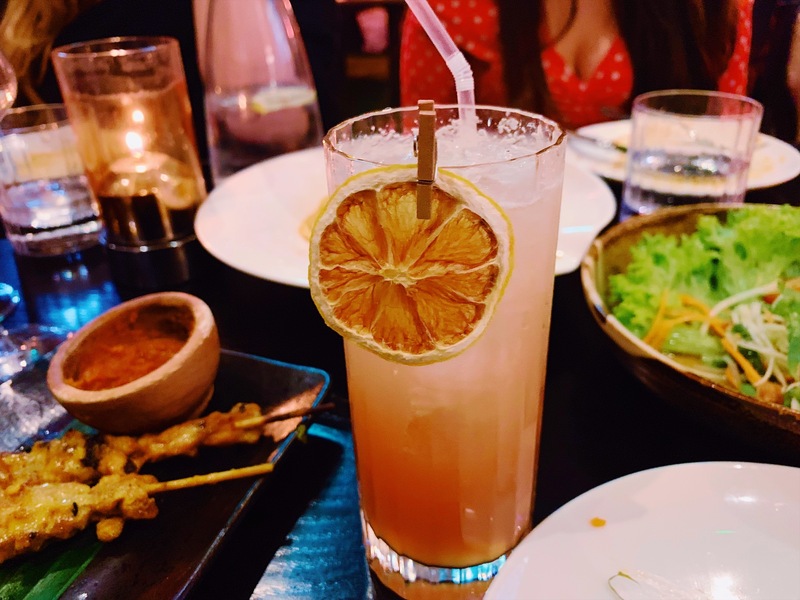 I did receive complimentary food at Chaophraya, and a £50 intu Eldon Square gift voucher as stated above, and chose to include them in this post myself. 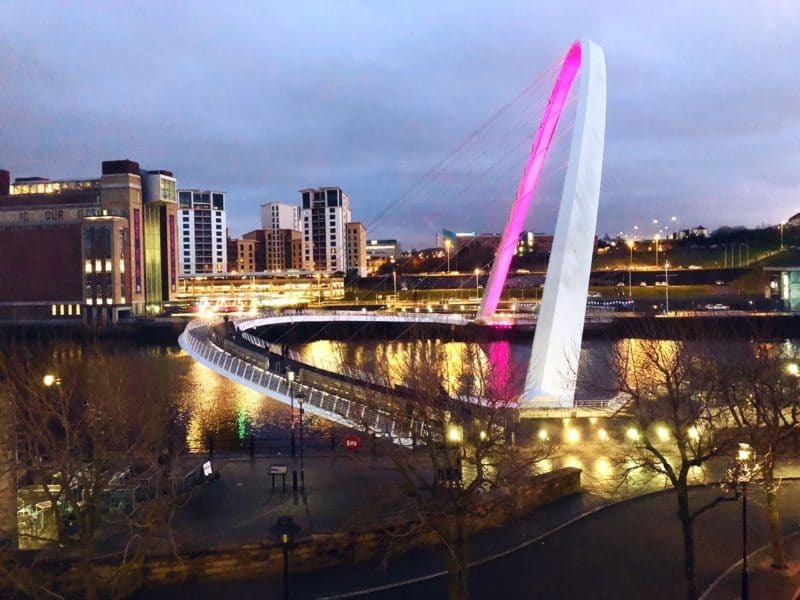 What an epic and brilliant post, Newcastle really is the place to be this winter! Love your pictures too Steph, I tried to get some yesterday but the weather had other ideas! Would love those blue skies to return! Fantastic guide! 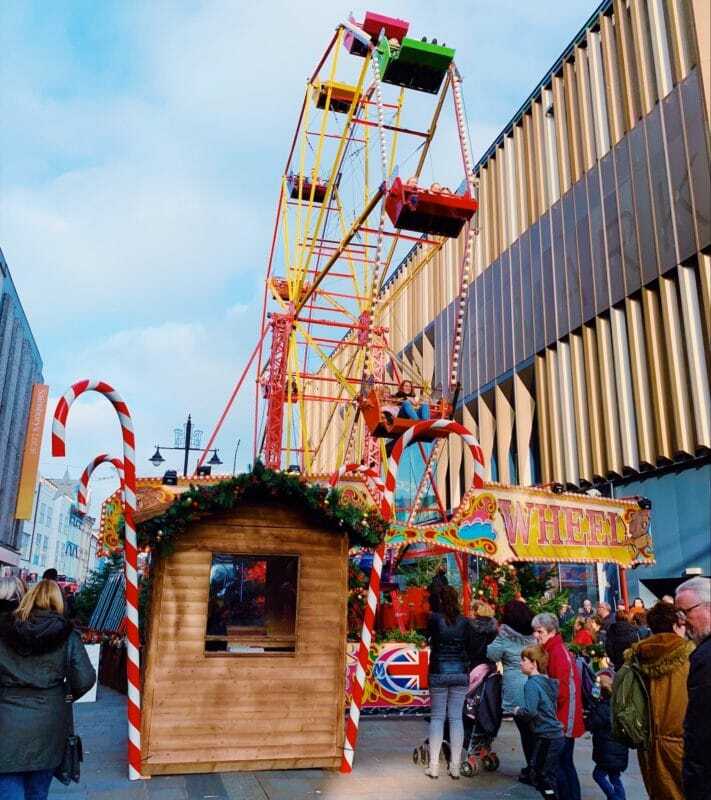 I agree the Christmas Market is so much bigger and better this year, we popped along yesterday and the food stalls are fantastic – I loved the Halloumi Fries and I definitely want to pop back for a Bubble Waffle. We followed that with a visit to the new Christmas Village and yes SO disappointing. I think if you have a ticket for the evening it’s probably great but going down there in the day I couldn’t believe how little was there. We must have been there only about 5 minutes before deciding it made sense to just go to the Market at Monument instead. There was just no atmosphere, everyone looked miserable and there was nowt there! I think they should have somehow combined the Village with the Monument Market and had it all in the same space! We’re off to Manchester at the end of December and I have to say I’m really looking forward to that, Manchester do Christmas so well!